If you are either new to paddle boarding or yoga you wouldn’t expect both of these activities to be drawn into one. Those who try it cannot get enough of it simply because it helps build strength in areas that would be harder to do on a simple yoga mat. Need more convincing? I recently wrote a piece on the benefits of SUP Yoga and why you should try it out on Book Yoga Retreats. Inflatable SUP vs Hard Boards Which do I choose? This comes down to board handling preference and how much storage space you have available. Hardboards typically sit lower in the water which makes them more planted while Inflatable SUP’s sit on top of the water. If you are short on space the obvious would be to get an inflatable board as they roll up to the size of a small suitcase and can fit in closets, cars storage lockers and anything else that is around it’s size. Here a little Bullet List Guide to Help You decide. For a Full detailed explanation check out my inflatable paddle board vs hardboard Guide. 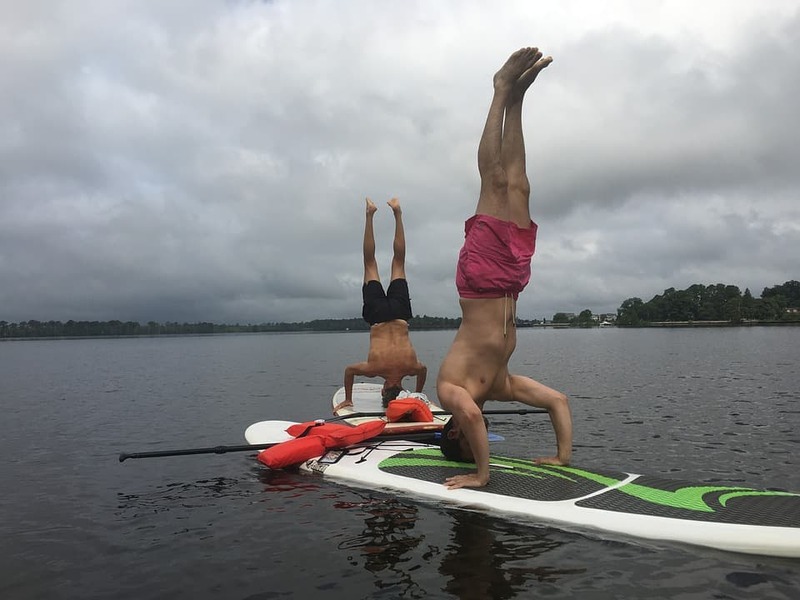 The main difference in terms of using the board for yoga is that an inflatable board sits on top of the water while a hardboard sits partially in the water. If you experience a bit of chop the hardboard will absorb it more because it is in the water while the inflatable board will but a bit more bumpy. This is why in waters with more chop a hard board is better but in calmer lakes it is just easier to get an inflatable SUP. These boards are ideal for SUP Yoga and come in a wide range of different price ranges so that folks like you can find at least one Inflatable SUP you can find reasonably priced. While there is a bit more of fa learning curve with inflatable boards they can be used as fantastic yoga sups one you get used to their behavior. It is recommended that you take your inflatable sup board for a paddle first before attempting yoga on it. This helps you get more accustomed to its behavior which you will be able to anticipate better when you are doing yoga. Don’t worry too much about falling in, it’s bound to happen a couple of times and that’s fine. As long as you have some kind of PFD and can swim you will be fine, just make sure you limit your paddle boarding yoga to calmer waters the first bunch of times. The ISLE Airtech Inflatable SUP is a very unique board because it has a wide-nose shape. This gives it a tremendous amount of balance and you can do yoga on it on the choppiest water. It is very portable and you can fold it and carry it comfortably in a backpack. The board is 10’4” so it is well suited for tall people to do yoga on. The board has a gripping pad which covers all the important parts of the board. The pad gives added grip. Though the two boards we have reviewed below have a complete surface pad, since the ISLE Airtech Inflatable SUP pad covers most of the areas which are needed when you do yoga, it is still worthwhile. The ISLE Airtech Inflatable SUP has a net to store the things that you may require while doing paddling which may include your paddle or your sandals. It is also very easy to transport as it has a strap for carrying the board. It has the capacity to carry a person of up to 255 pounds which should be good enough. Though it is made for flat water, you can also use it to ride small waves when you are doing yoga if the water gets choppy. Best for: The ISLE Airtech Inflatable SUP has great design and stylish colors. This makes it a favorite in the market, especially for women. It is a stable board which is perfect for yoga and due to its versatility; it can be used by any yoga enthusiast. The Red Paddle is a company which has been making inflatable yoga SUPs from the start of the industry and the great thing about the company is that they keep working on improving their boards. The Red Paddle Co Ride is a very good example of that commitment. The board has a high-quality Eva pad. The company has not spared any cost and almost the whole surface of the board is covered by the pad. This gives you a firm grip regardless of the position you are in. Even when the board is cruising, you still get a firm grip on the board. The pad also makes it very comfortable for you to do yoga for a long period of time without making your hands and feet sore. The Red Paddle Co Ride has a navigation system which is triple fin and dynamic. The central fin can go through the water smoothly. This makes maneuverability of the board very good. The side fins give you better-tracking ability. The Red Paddleboard comes in two sizes i.e. standard 10’6″ long and 32″ wide, and 10’8″ long and 34″ wide. The features are same. You can choose the board depending on your height. Though both the boards will easily accommodate tall people, some people prefer a longer board so that they can move from one yoga asana to the other with ease. The Red Paddleboard is expensive but it is well worth the money considering the quality of the board, the sizes available and the great navigation system. The yoga mat helps you balance well on the board even while it is moving fast and gives you a great grip. Best for: It is perfect for a beginner who needs to improve on their balance. The Solstice Bali SUP is an affordable yoga board that is stylish and made of excellent material. It is perfect for a yoga beginner as the price is competitive and it still gives you great balance on the water. It is large and wide which makes it great for yoga. You can inflate the board very easily and it is light so it is easy to transport. It is a no-fuss board which you can just inflate and take into the water. The Solstice Bali is a high-quality yoga board. It is made of 1000 denier PVC material. This gives you a lot of rigidity once the board is properly inflated. It also makes the board easy to ride and gives you a lot of comfort. The company has an industrial drop stitch for the construction rather than using glue. This ensures that the board has a long life and is durable. The Bali comes with a gripping pad which covers almost the entire surface. This gives you a better grip when you are doing yoga. It also makes it very comfortable to use the board especially if you are planning a long yoga session. The yoga board also has 4 D-rings which you can use to connect a bungee cord and can use it as a cargo net. You can use the net to hold your essentials like a paddle, etc. Best for: The board is a little narrower than most of the yoga boards in the market which makes the balancing a little more difficult. The length is great so it is good for tall people. Anyone below 200 pounds can comfortably work on it. It is great for beginners considering the price. If you have space and the budget then these boards are for you! Yoga hard boards are typically better for ocean conditions as they do not get pushed around by the waves. If you live by the beach and its a relatively calm day a hard board would be most ideal just because they are not pushed around as much by waves due to the fact that they are partially in the water. When Looking for a Hard Board be sure to check it’s maximum capacity and rider height recommendations so that you do not choose the wrong board. The BIC Sport Ace-Tec is an excellent blend of performance and price. It is an all-round, multi-purpose hardboard which has a lot of versatility. You can use it for Yoga as it is very stable and 10 feet in length. You can use it as family hardboard. You can use it to cruise and have all round fun. Since it is an all-round, board it performs well great in every condition and it is perfect for all levels of ability right from a beginner to an expert. It has a Keeled nose. This helps improve the glide and tracking performance. It has better stability compared to other hardboards as it has a rail-to-rail volume that is full. The deck is flat and stable which makes it perfect for Yoga and other fitness exercises. When you have the hardboard on the water, especially when you are doing yoga, you need to store your accessories like yoga equipment, water, a paddle, and leash, etc. The BIC Sport Ace-Tec has 6 deck attachment points. This is great for storing and transporting your gear. When you compare the BIC Sport Ace-Tec with other hardboards in the market, it is lighter, stiffer and has better performance with the same durability. You should choose the Platinum version for yoga as it has an extended deck pad. This gives you more space for your asanas. Best for: The BIC Sport Ace-Tec hardboard is all-round which is perfect for any level from beginner to expert. It is great for all activities especially fitness and yoga. You can also use it to cruise or to spend an enjoyable day in the water with your family having fun. The Isle Versa Epoxy is one of the best brands in the paddleboard market. Their paddleboards have excellent designs and are made of very high-quality material. The Isle products are manufactured in San Diego, California for the past 14 years and they have a very strong commitment to providing excellent quality, classy design water sport products. The quality of this yoga board is great and it will last you for many years. Even the accessories that come with the hardboard are of high-quality. The paddle is made of nylon and carbon. The Isle Versa Epoxy is wide at 32” which makes it easy for you to do yoga on it. The Isle Versa Epoxy board can carry a weight of 275 pounds which is good enough for most users. The board as a classic long board shape which is very thick at 4.5 inches and has a width of 32 inches. This allows you to use it for a variety of activities in the water along with yoga. You can use it on flat water and in the surf. Since it is lightweight at 27 pounds, you can transport it easily unlike other hardboards. The Isle Versa Epoxy Yoga Hardboard comes along with a traction pad and an adjustable carbon shaft. It has a nylon paddle blade and a center fin. It has a very durable backpack and comes along with a grooved carry handle which makes it very easy to carry. All the accessories are made of high-quality material. Best for: The Isle Versa Epoxy board is perfect for a beginner and an intermediate paddle boarder who wants to use the board for yoga. You can also use it for fishing, surfing and taking your kids out in the water. The ISLE Cruiser Soft Top Stand up Paddle Board is an excellent hardboard from the Isle brand if you are looking for a SUP board for yoga. The Isle Cruiser Soft Top is positioned more as a beginner paddle board and has a soft top which gives you great grip when you are doing yoga. The price is cheaper than the Isle Versa Epoxy though the board is as durable and strong. It is made by the same excellent high-quality material. The ISLE Cruiser Soft Top Paddle Board is heavier at 28.5 pounds due to the additional soft top but the soft top gives a firm grip to a beginner. The weight capacity of the board is not as good as the above one as it can only accommodate up to 235 pounds comfortably but this should be fine for most boarders. You need to make sure though that your own weight and that of your accessories which you will take with you on the board doesn’t exceed the weight. Best for: This is an excellent stand up paddle board for a beginner. The price is competitive so you save a lot along with getting a high-quality board. The board has a soft top due to which you will get a firm grip and can do yoga easily. Durable soft deck. Soft decks of other brands peel out with use. Once Stable and standing on your board, place one foot in front of the other and bend the knee of your back leg while planting your front foot on the board. Once you are in that kneeling pose keep your back straight and keep your hands raised in the air. After Downward Facing Dog, simply lay your palms flat on the board, start using your hands to move forward and make it so your body is parallel to your board. Next place your shoulders back, engage your lower belly and hold that position from 30 seconds to a minute. The former if you are just starting out. Probably the easiest pose to do for just about anybody, simply lie on your back in the starfish position and let your hands touch the water. This pose is more about being in a relaxed state then anything else, simply close your eyes and absorb that sunshine while letting your hands gently touch the water. This is about as relaxed as you can get! There are a few factors we will talk about when looking for the best SUP board for yoga. Below is a video made by STand Up Paddle TV that illustrates the basics for those of you who like video format. These are probably the most important factors. Unless you are a highly skilled and trained Yogi it is useless trying to do yoga on a board that unstable. In terms of boards usually the wider the board is the more stable it will be. For Yoga I recommend that you get a paddle board that is at least 30 inches wide. I would also make sure that the board is at least 9 feet and 8 inches length. Before going ahead and buying a board take a look at the dimensions and look at the manufacturers recommendations as often times the weight capacities differ from board manufacturers. As you can guess inflatable paddle boards are a lot more portable than than the hard boards. That said if you do have the space and the budget for a hardboard and you have no problems transporting it a hardboard would be a good thing to have. If you do not have the room, inflatable it is! The right kind of paddle board is ultimately dependant on you. What you should first factor in is the size of your board, your weight and height will ultimately determine that. Next you have to figure out if you want an inflatable or hard board? Hard boards are better for performance and are a bit more stable but inflatable Yoga SUPs are more budget friendly and a lot more transportable and storable. Where you will be paddling will also be a determining factor in all of this. If you have any questions feel free to comment or email me and I will be more than happy to answer any questions.